Students must be placed by the Ministry of Education through the Grade Six Achievement Test (GSAT) or the Grade Nine Achievement Test (GNAT). 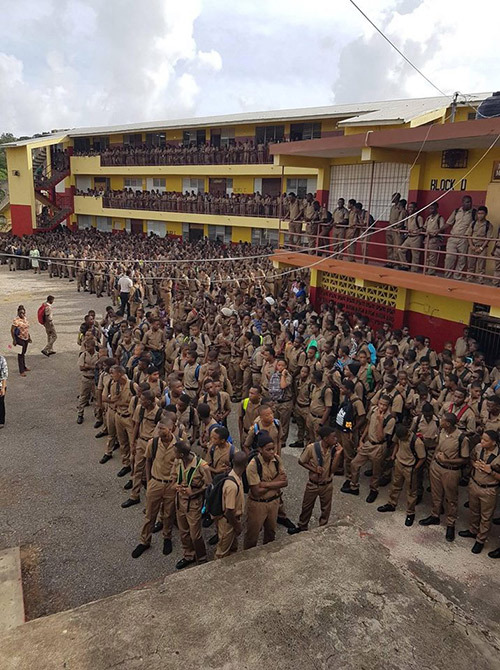 Students' acceptance may be granted based on space availability to those who are relocating to Montego Bay and its environs from other parishes (eg. Kingston, Manchester, St. Elizabeth). Make a request to the Principal, in writing, explaining the reason for the request, as well as what skill/talent the student will be offering the school. Include also, the student’s GSAT grades (for students wanting to enter Grade 7), or the last report from the school the student is currently attending. For potential transferees, a confidential letter will be given to the applicant in a sealed envelope to be completed by the principal of the school the student is currently attending. The completed letter must be returned in a sealed envelope. If the student meets the criteria for acceptance and space is available, the student will be invited to sit for an interview with the Dean of Discipline and Guidance Counsellor following the completion of character verification.